This piece offers a stunning new twist to sword cane design! The clear acrylic handle coating acts as the perfect display case for the cold cast artwork within. Oriental dragon, burning sun and clouds appear vibrant within the handle. The colors and details will not wear off with use. Equipped with a 15 1/2 in. stainless steel blade which slides into an aluminum shaft. Cast metal bolsters thread together to secure this piece, and a slip resistant rubber tip is included. 37 in. overall. 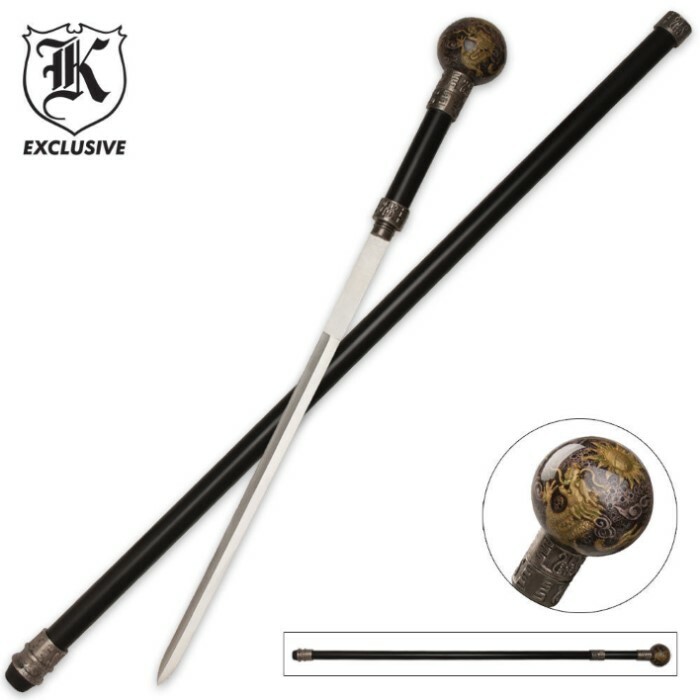 As a vendor and collector, this Sword Cane is a keeper. It arrived today and it is in perfect shape, it looks better than I thought it would. I like the no slip rubber bottom and their is absolutely no rattle from the cane at all. Very much pleased with quality of this cane, True Swords comes through again. I HAVE SPENT THOUSANDS OVER THE PAST YEARS WITH BUD K BUT I HATE IT WHEN THEY SAY SOMETHING IS ONE WAY AND THEY SEND YOU SOMETHING ELSE. BOUGHT THIS CANE ONLY BECAUSE THEY SAID IT HAD A 23INCH BLADE BUT IT DOESN'T IT HAS A 12 OR 14 INCH LOOSE PIECE OF CRAP BLADE AND THE CANE HAS SCRATCHES ALL OVER IT. SHAME ON YOU BUD K . WHEN THEY START LYING IT'S TIME TO STOP BYING. Great looking piece, however, know that it's for display, nothing more. It's mostly held together by glue (The clear cane head respectively)However, the threaded mechanism attached to the shaft of the cane isn't clued on, isn't "tack welded", it's simply stuck on and shipped out. It came apart while pulling it out of the box, that is inexcusable, I wont return it as it's a quick fix in my mind. That this is just plane sloppy. Nice heavy cane. I like the design, I was looking for a screw off sword for strength and durability. I would recommend it. This sword is so similar to the White Skull sword cane, I can relate to much of what's said in other reviews. My belief is that these sword canes aren't for everybody, Yes, the blade is thick but unsharpened,this isn't all bad, in the first place if you're going to own a sword you should know how to sharpen it. Yes, it screws on, think about it- the 3 seconds it takes is time enough to realize that maybe it's not a good idea to be swinging a sword. I read the reviews befor I made my purchase so I expected a rattling blade, I solved the issue by cutting several 3/8" varied lengths of the box it came in and dropped them down inside the cane =problem solved. Think about it most likely you're spending $24.00 what do you really expect, put some personal labor into it and make it yours, you'll feel more satisfied you have the chance to change a 2 star into a 5 star, I did. The cane is attractive. It's totally non-functional. The blade is a thick slab of unsharpened metal. You have to unscrew the handle to get the blade out. Sometimes the shaft gets stuck because the threading is not right. It does rattle with every step or when you just move the cane. Not the best weapon to have if you need to respond to a bad situation, unless your attackers will wait a minute for you to be ready to defend yourself. Good chance there. Cane just what I expected and made a nice gift. Thank you for the quick service. Would recommend to anyone.